Solar scientist Eugene Parker is the first living namesake of a spacecraft. The Parker Solar Probe is set to launch toward the sun on Aug. 11, 2018. NASA's Parker Solar Probe, set to launch this weekend, is the first spacecraft ever named after someone still living: Eugene Parker, the groundbreaking sun scientist whose theories redefined how we understand our nearest star. 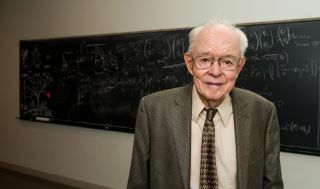 Parker's pioneering work at the University of Chicago in 1958 proposed the existence of the solar wind, the stream of charged particles constantly released by the sun that flows through the solar system at close to 1 million mph (1.6 million km/h). "Why Dr. Parker? Because this mission is there because of him," Nicola Fox, a Parker Solar Probe project scientist from Johns Hopkins University in Maryland, said during a news conference July 31. "He's really the father of this whole physics branch. Heliophysics is the study of the sun and what it does to the solar system, and the way it does that is the solar wind. Gene was the one who predicted it and profoundly changed the way we thought about how our star worked." "Without Gene, there probably would not have been the same amount of passion and the same amount of 'let's go do this' that has kept [visiting the sun] such a high priority for 60 years while we waited for that technology to really be there to be able to do this really daring mission," she added. Finally, technology and materials research has progressed enough to send a spacecraft up close to the sun to see how it all works. The Parker Solar Probe is set to provide the best-ever data on many of the questions his work has raised during seven years of investigation, diving closer and closer to the sun before eventually passing through its wispy outer atmosphere, called the corona. "Frankly, there's no other name that belongs on this mission," Thomas Zurbuchen, associate administrator for NASA's science mission directorate, said during a briefing yesterday (Aug. 9). "I did a tally with my team and basically said how many missions do we have in our mission portfolio that directly are involved in looking at things and measuring scientific phenomena that are predicted by Gene's papers — and the answer is 35." "Thirty-five missions, both here in our environment, in heliophysics missions, but also in astrophysics and missions in planetary sciences," he added. Parker himself had the chance to discuss the mission during the news conference on July 31, taking the stage at University of Chicago where he's a professor emeritus. "Sometimes people sound a little puzzled as to why do you want to go to such a hotspot?" Parker said. "And the answer is because we have reason to believe that interesting things are going on." Some of those puzzles, which the Parker Solar Probe will address: It will examine how the solar wind is accelerated so powerfully out of the sun; help scientists learn how the sun's corona is so much hotter than its surface; and reveal connections between changes in the sun's magnetic field and the space weather felt on Earth. The probe will launch during a window starting at 3:33 a.m. EDT (0733 GMT) Saturday, flying on the powerful Delta 4 Heavy rocket from Cape Canaveral in Florida — and eventually becoming the fastest-moving human-made object, researchers said during the briefings. It will swing through its first close approach to the sun on Nov. 5, after a pass by Venus to slow its frantic pace a bit, beginning a series of 24 close approaches to gather data. The probe's final approach will be in 2025, and it will journey less than 4 million miles (6.5 million kilometers) from the star, within the corona's outer edge — and the intricacies of what it's able to record are anybody's guess. "I suspect it's going to be complicated; I suspect some of us will argue with each other as to exactly what's going on," Parker said. "But you've got data to work with, and you have a chance of getting it straightened out."